Overwatch’s Lunar New Year event is coming back next week and we’ve got a list of heroes that need some new skins and other cosmetics. The event will be all about the Chinese Year of the Pig and will take place from January 24 to February 18. In the announcement video, Soldier: 76 is twisting a pellet drum toy in between his gloves — which might be a new emote. It’d be cool if he plays with it forever like Zarya’s never-ending, legendary Mystery Gift emote, but we’ll have to wait until the event goes live. I’m sure Blizzard will tease upcoming skins throughout next week, but for now, all we have left is to guess at what will come out. If you take a look at a slightly-dated list of post-release event skins, you’ll see that heroes like Orisa, Genji, Winston, and D.Va don’t have a lot. Now, let’s imagine some pig-themed skins for the heroes that lack a good assortment of them. First of all, D.Va is already pink and her Meka could be adorned with a pig tail as well as a nose and I’d be sold. Orisa has four legs, so it wouldn’t be that hard to turn her into a big, Omnic pig. Better yet, what if Orisa got another emote like her puppy one, but it was a baby pig? Winston is already an animal himself, but if he got one, I want it to look like he strapped a pig nose onto himself versus actually being a pig — we already have Roadhog’s Bajie skin. 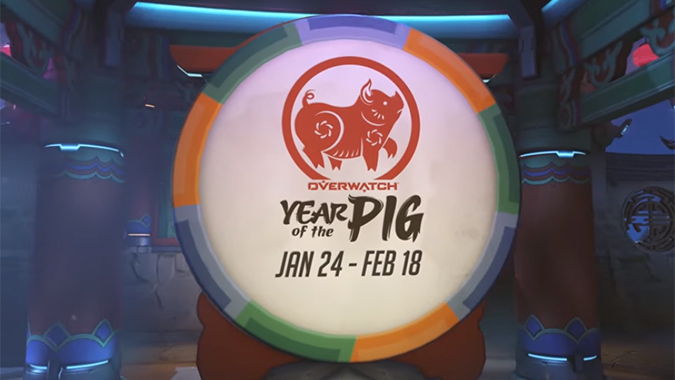 Those are the most obvious skins, but the Year of the Pig is also about how the pig was chosen as the last animal in the Zodiac cycle because it’s lazy. I would like to see a highlight intro of one of the heroes — maybe D.Va — getting woken up from a nap for Play of the Game. I can kind of picture D.Va waking up in her Meka and panic Defense Matrixing before flying past the screen. There’s a lot of potential for the event, which should bring back Competitive Capture the Flag as well as the Lunar New Year version of the Lijiang Tower map. If you look closely at the video, it looks like we might get a night time Busan too.